The G-MEN – arts, ink. 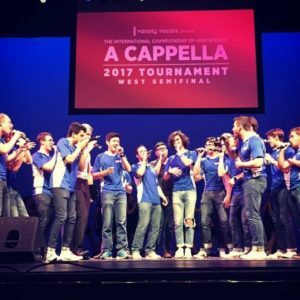 The Michigan G-Men hosted an astounding a cappella and sung word concert in Rackham Auditorium last Saturday. 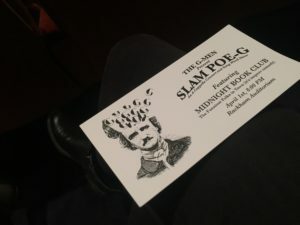 Introducing the show was the talented and quirky Midnight Book Club improv comedy group. They began the night off on a single word volunteered by an audience member; the word “banana” served as the foundation for the entire skit. From the animated personalities to the goofy transitions between acts, the group got a good laugh out of the crowd with their humor. Following Midnight Book Club, the sharp-dressed G-Men entered stage. Each of their characters could be distinguished within the first moments of the show. They would banter with each other and us, making the audience feel as though we were all friends. They picked a slip of paper with a name on it from a collection of names in a beat up blue UM baseball hat. When a G-Man’s name was selected, he went to the microphone and introduced the next song with his own personal poem. Every single approach to the mic, to the poem, to the delivery of the poem, was unique, just like the members of the group and the talent that they offered. Wowee those boys can sing! The goose walked over the grave after the first song as my attention was captivated by the perfect fusion of their voices. “Dust Bowl Dance” by Mumford & Sons took the listeners back in time as their voices surrounded the auditorium and transported us to a setting of the song. With “Mr. Brightside” by the Killers, they created a totally expected sound out of a hit, keeping things interesting. In addition to their talent, they put on a great overall show. My favorite part of the show was the easygoingness of the group. If any transition or poem reading did not go flawlessly, they made fun with it. If a joke was funny, they laughed. If a joke wasn’t funny, they laughed about how it wasn’t funny and proceeded to make the best of it.